Fan favorite Willians Astudillo got his first start of the season, and he definitely put on a show! These were just a few of my excited Tortuga tweets. Twins win! 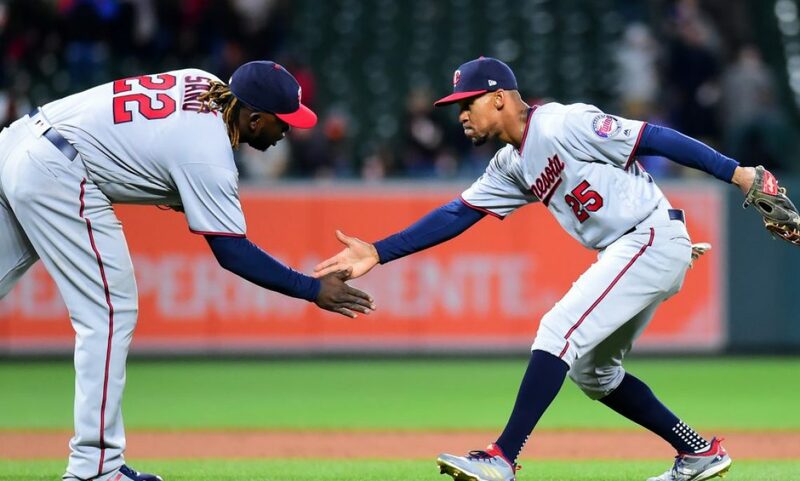 The Minnesota Twins best the Cleveland Indians 9-3 to get the series win to start the season. The offense finally came to life and they did it in a big way, exploding for eight runs. For the third game in a row the pitching was able to remain a very bright spot for this team with Michael Pineda, Martin Perez and Ryne Harper all having good outings. Willians Astudillo went 2-2 with two doubles, a sacrifice fly and a hit by pitch. He drove in two runs and also scored two runs. He also looked good behind the plate today and he has earned a spot in the catching rotation. Today’s starter was Michael Pineda. This was his first start since getting hurt and having to get tommy john surgery in 2017 and he did not disappoint at all. He threw four inning on 40 pitches, giving up just one hit (could’ve been an error) and striking out five. If he wasn’t on an innings limit then he looked like he wasn’t going to slow down anytime soon. One thing of note was that his fastball velocity dropped from 95 in the spring to 90-92 today. Pineda was replaced by Martin Pérez in the fifth inning. Pérez is set to eventually become the fifth starter when the need for one appears. He threw 3.2 innings of solid baseball but ran into trouble in his final inning, giving up a three run double to Carlos Santana. He was looking good with his velocity, consistently hitting 96-97 MPH now he will just have to fix the release point. The final inning went to 30 year old Ryne Harper. He made his first ever MLB appearance today and was able to strikeout his final batter and shake hands with the team. If you don’t know yet, Harper made the team after a spectacular spring as a non-roster invitee. This was his first time pitching in the majors, but he was previously in the MLB for three days with the Mariners but never got in a game. He’s a fun guy to cheer for and hopefully he can keep his spot in the bullpen. The offense finally did its thing! We already talked about Astudillo, but Nelson Cruz destroyed his first home run as a Twin over the left field wall for 427 feet. Cruz actually went 3-5, hitting the ball hard every at bat. Byron Buxton and Jonathan Schoop drove in the other runs. Buxton scorched another double off the left field wall and Schoop doubled to left to drive in a run. Player of the game: The fans voted, and not surprisingly it was everyone’s favorite player Willians Astudillo. Follow my Twitter @MnTwinsTalk18 for daily player of the game polls and more.